Mediafootprint » Are Your Goals SMART? The next time you set a business goal, career goal or financial goal, think SMART. It is a highly effective model used to achieve and hit your targets. The SMART philosophy is extremely useful and simple to use. SMART can be applied throughout your entire business. Each department should have a SMART goal. It helps set the path to success because it assists you to set and achieve specific goals that have definable steps and actions. What is SMART? It is an acronym that stands for specific, measureable, attainable, realistic and timely. S – Specific: The goal must be clear and define. It is unambiguous. It should be a goal that narrows down or pinpoints a certain achievement. A specific goal asks the six (6) “W’s”. A – Attainable: A goal is attainable (within reach) if you plan your steps wisely and watch your time line. This can be a stretch goal, but should not be one that cannot be accomplished. You build the attitudes, abilities skills and financial capacity to reach them. It helps to think “how” will the goal be accomplished? R – Realistic: The goal should be within reach and realistic. It should be a relevant goal that represents an objective that is worth working towards. Can this be accomplished in eight weeks? Can this be accomplished in eight months? 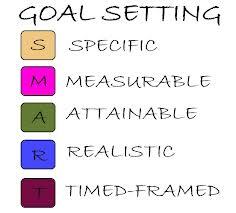 A great benefit of SMART goals is that it can also be applied to your daily life.